Honestly, does Pyrex ever disappoint? I got my first Pyrex set as a high school graduation gift. Not realizing vintage Pyrex sets can sell for $1,800, I gave them to my college roommate when I moved out of our apartment. I had deemed them too heavy to pack. So, after that, I just used cheap plastic storage containers, much to the dismay of my co-workers. If I had a dollar for every dirty look I got when I reheated my lunch in Rubbermaid in the office microwave, I wouldn't need to pack lunches for the rest of my life. However, recently, and especially after a whale washed up with 48.5 pounds of plastic in its stomach, I've taken steps toward using less plastic. The first step? Investing in a best-selling 10-piece set from Pyrex. "Made in the USA and they're glass"
The title of one of the most recent reviews (there are nearly 2,000) of this set on Amazon is "Made in the U.S.A. and they're glass." I reached out to Pyrex who confirmed that yes, this set is still made in America. The brand has been a household name for more than 100 years. In fact, it's so beloved people are getting Pyrex tattoos. 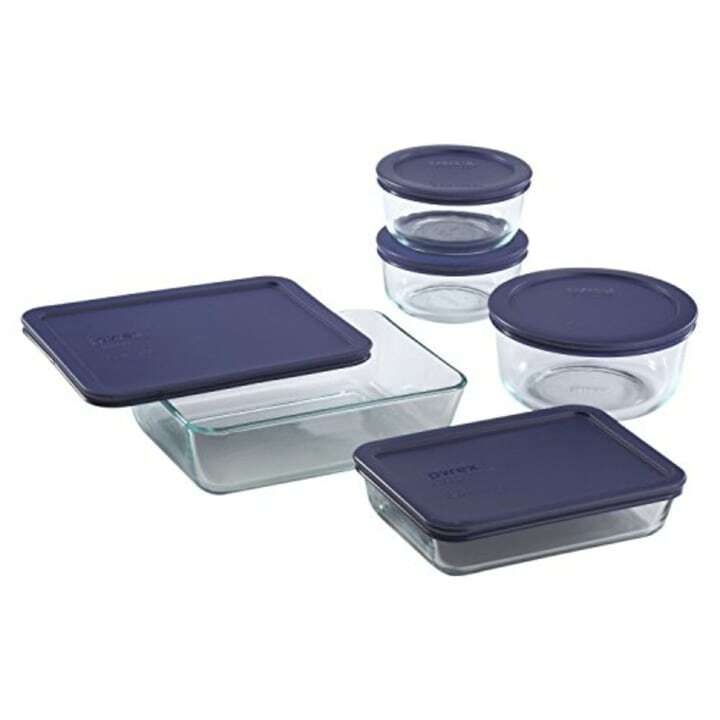 The five containers in this $23 set, which has a 4.3-star rating and is in the top 10 food storage and organization sets on Amazon, are all made of glass. Their lids are made of BPA-free plastic. So far, I'm loving how easy they are to clean. Glass is less porous than plastic, so acidic foods can't stain it easily. In other words, I no longer have to be reminded of leftover sloppy joes every time I open my cupboard and see my sorry-looking plastic containers. This particular set comes from Pyrex's Simply Store collection. Every piece, including the lids, can go in the freezer, microwave, dishwasher and even oven. The best part? I could use the same container I baked them in to store any leftovers. 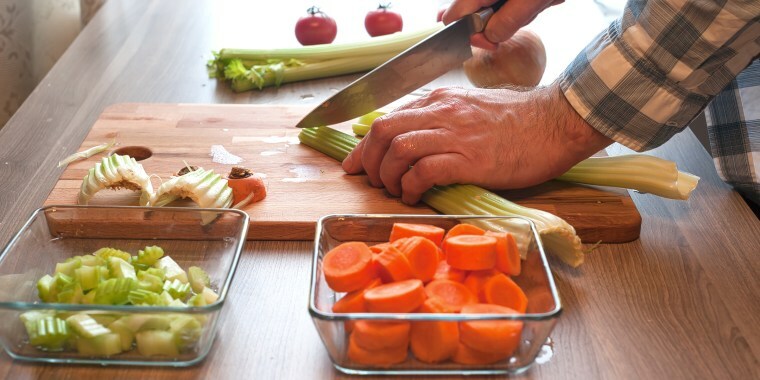 That alone warrants them making TODAY.com's list of best-in-class food storage containers. It's important to note that some of the negative reviews mention shattering. One reviewer, who writes that they've been using Pyrex for 15 years with no issue, had a glass bowl explode in the microwave. However, Pyrex says less than one tenth of one percent of the millions of Pyrex products sold each year experience thermal breakage. There's also never been a Pyrex glassware recall. Instances of shattering or exploding are probably due to not following the safety and usage instructions that come in the box. For example, when I was baking brussel sprouts in the largest dish in this set, I had to make sure the oven was already preheated. My brussel sprouts turned out great. No one likes to pack a leaky lunch. So, I used my mom's homemade salsa to put these containers to the liquid test. They passed. When I held them upside down, not a drop came out. I've also used them to store homemade peanut butter and oatmeal cookies. Several days after being stored in these containers, the cookies still had the same taste and texture. And, for the record, the reason the cookies lasted so long was because we tripled the recipe. If I keep baking like this, I might need to invest in the equally popular 18-piece set. Since buying these, I like to think my carbon footprint is a little bit smaller. They've also helped me achieve a more organized kitchen pantry, since they easily stack into each other. And, I'm not embarrassed to pull the Pyrex set out in public. They even look nice enough to go on the dining room table and serve guests. You know what I won't do, though? Send friends and family home with leftovers in them. I don't want to risk never getting them back. Who knows? They could be worth thousands one day.